The funnest part of writing fantasy and science fiction is definitely world building. Making maps or designing fictitious timelines is loads of fun and helps me as a writer involve myself deeper into the story that I am writing. For Heir to the Sundered Crown and my as yet unpublished Terran Defender series I created timelines which span hundreds and thousands of years. The best way to make a timeline is to look at our own real life history as it is filled with interesting events which have molded and changed the world we lie in. For fantasy you can look at events from the Medieval period or ancient world for inspiration. Epic events have occurred throughout history, from wars for crowns, the fall of empires and the rise of tyrants. For HTTSC I was inspired by many of those events and all I did was then chuck magic into the mix. Sci- fi is a different thing entirely however as the things your write about have yet to happen in the real world. With Sci-fi you can really cut loose! 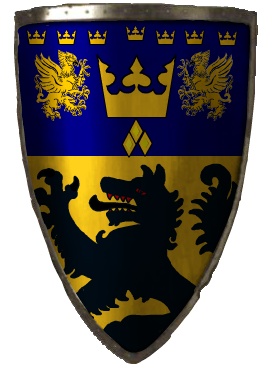 As part of the world building process I made a coat of arms for the realm of Delfinnia which is below.